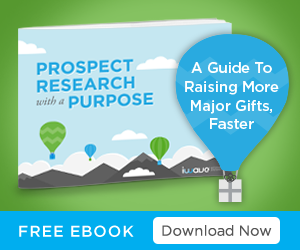 Prospect research is a comprehensive analysis of a prospective donor’s potential to contribute to your nonprofit with a major gift. 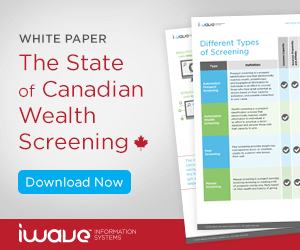 Wealth screening – or as we like to call it, prospect screening – is just one step of that overall research process. However, screening is a fundamental strategy that can save time, resources, and help you raise more major gifts, faster. 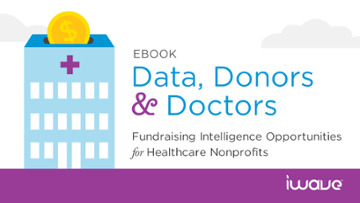 If you are gearing up for a campaign or looking to increase your annual giving, screening your donor database is a no-brainer. But, not all screening solutions are made equal. Look for these must-haves when preparing for your next screen. Input equals output. In other words, a prospect screen is only as good as the data included. Some vendors boast about having “twice the datasets as others” – but that’s not what makes a screen effective. It’s about data that is appropriate or relevant, accurate, and current. In other words? It’s about quality over quantity. We chose our data sources based on client feedback and market demand. This list of datasets is constantly evolving – in fact, it changes about every three months! As we all know, past giving is an excellent indicator of future giving. That’s why we introduced our own charitable giving database, VeriGift, which includes over 100 million charitable giving records. Each record is verified – you can even click on the PDF to see the original source material, such as an annual report or 990 form. It’s just one of the ways we try to make iWave’s data more transparent. VeriGift is the #1 used dataset in PRO and is a major component of PROscreen. Why? 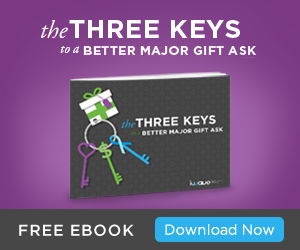 For starters, you can find clues about propensity, affinity, and capacity all in one place. If a prospect exists in VeriGift, there’s already evidence she’s philanthropic (propensity). The record also includes which organization she gave to (affinity) and how much (capacity). With gift records stretching back decades and with thousands of new records added daily, there’s a lot to learn about your prospects in VeriGift. What’s more, PROscreen is the only way to screen against VeriGift’s leading data. But if a screening tool is only as good as its data, then how the data is filtered is extremely important. That leads us to our next must-have. Ensuring quality screening results starts with selecting relevant and focused criteria for your project. Which records should we include? Who will be responsible for dealing with the information? Will our screening tool allow us to customize settings to suit our needs? But what if you’re a veteran researcher and research is old-hat for you? Or, what if you’re brand new to research or screening and aren’t sure where to start? Both scenarios can’t be ignored. That’s why we recommend this third and final must-have for choosing a screening solution. Screening is not new – researchers and fundraisers have screened their donor databases for nearly 20 years. For most of that time, however, the screening process was antiquated, unreliable, and expensive. 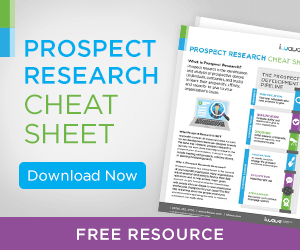 Researchers spent hours compiling lists of new prospects to submit to a vendor for processing. Nonprofits had little control over the screen settings and had no ability to customize to their unique needs. It could take several days or even weeks to get the screening results back, and by that time the results were already out of date. We knew screening can be better, and we set out to prove it. 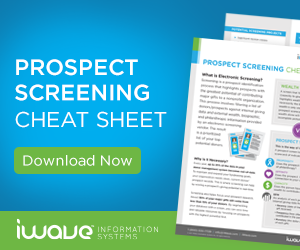 In May 2016, iWave introduced PROscreen. Using PROscreen, researchers can upload a list of prospects, customize settings to suit organization and project goals, and submit. No need to worry about outdated results – you can get PROscreen results back in hours, sometimes minutes. Screening used to be expensive, with vendors charging nonprofits by the record. Fast forward to today: every Prospect Research Online subscription includes credits that power PROscreen and several other features, such as creating comprehensive PROfiles. Screening is an important step in the research process, but it doesn’t need to break the bank. At the end of the day, the right process is the one that works for you. Our goal with PROscreen was to put the power in your hands – to give you the ability to customize, add/delete records, and verify where the records came from. It’s all part of why we believe PROscreen is the smartest screening solution out there.